The status quo that existed before October 26 can be restored now following the interim order given by the Appeal Court as it is given against an individual and not against a post, UNP Leader Ranil Wickremesinghe said. Mr. Wickremesinghe expressed this sentiment during a public rally in Galle last evening. “The decision of the Appeal Court is given against an individual and not against the post and against a government. Therefore the status quo prior to October 26, 2018, could be restored. 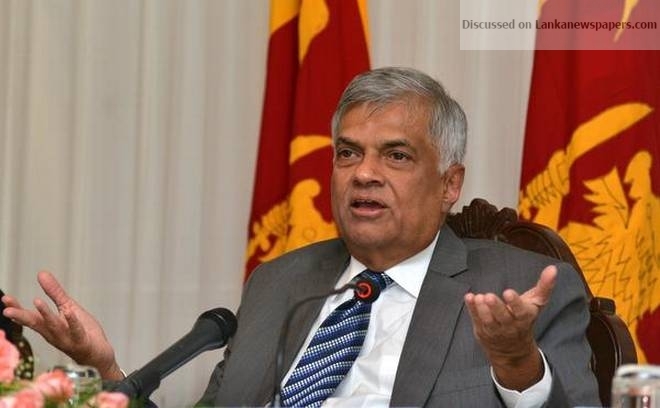 In such a situation our administration which existed before October 26 can function as a legitimate government,” Mr. Wickremesinghe said. “The illegitimate government should now resign. They should now go for God’s Sake ( Hatharwaran deviyange namayen),” he added. He said the 19th Amendment to the constitution had made it possible for the Appeal Court to give this kind of a decision. “Former President Chandrika Kumaratunga wanted to appoint the late Lakshman Kadirgamar after the 2004 general election but ended up appointing Mr. Rajapaksa instead. I asked Ms. Kumaratunga as to why Mr. Kadirgamar was not appointed and she told me that he did not have a majority but Mr. Rajapaksa did. This is how the practice was when it came to appointing a Prime Minister even at that time,” he also said. He added that holding an election was not an issue but said political parties in Parliament could decide on a date an election when it would be held. Dr Rajitha Senaratne said they would go to ministries today. “We will go to the ministries which we held prior to October 26 as we are the legitimate Ministers now,” he said. MP Patali Champika Ranawaka said the President should not have any hesitation in handing over the government to the UNF now. He said drastic action would be taken if a new government is not appointed by Wednesday.